A couple of weeks ago I was browsing the boards at Supernaturale (a site I found through one of Stacy's links, I think), and I clicked on the Swap & Trade board. There I found someone who was interested in obtaining some of the Built by Wendy Simplicity patterns, and she was located in Portugal. Well you know what my first thought was... Patrones! 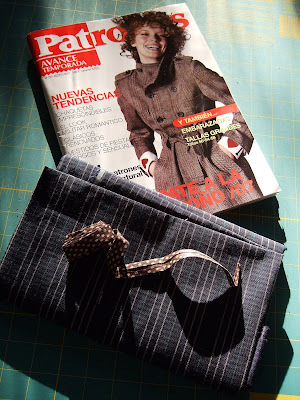 So we had a nice little email exchange, and look what was waiting for me in my mailbox today - not only the latest issue of Patrones, but also vintage navy plaid fabric and dotted bias binding! I'm so behind in getting the Patrones. So, um, will you be posting some photos from this edition?? BTW, the new roommate brought me a German edition of BWOF. The patterns come in a separate little pull out -- not stapled into the middle. Much easier for storage. I need to check out that trade/swap link.